The prolific actor took the long, unconventional road to success but is now living his passion with the one regret: Lesser family time than he’d want. It’s a constant balancing act, he admits, but one he’s navigating mindfully. 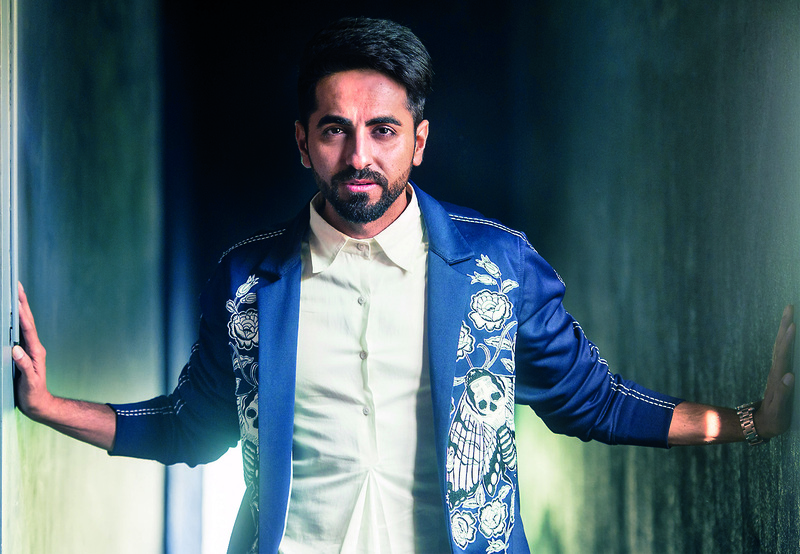 His road to Bollywood was long and winding but now that Ayushmann Khurrana is here, the 34-year-old has become India’s favourite everyman. Khurrana’s slice-of-life films tackle progressive social ideas that range from fertility issues to body shaming, with a generous helping of oddball humour. The multifaceted Chandigarh-born actor started with theatre in college, won a reality show, became a RJ and then a VJ before his debut film Vicky Donor (2012) brought him overnight stardom. Success has since been a constant companion, allowing him to dabble in writing—he co-authored Cracking the Code, a guide for those looking to follow his journey into the bright lights of Bollywood—and singing. Juggling so many balls at the same time has meant Khurrana hasn’t been able to focus on his family as much as he’d like to. On a long telephone call from his hotel in Kuala Lumpur, Malaysia, where he was shooting, the actor-singer spoke with Thrive Global India about what he’d like to do better as a father and how he draws inspiration from his cancer survivor wife. Your career is an example of the road less travelled. Was that a conscious decision? Sometimes you choose a path and sometimes the path chooses you. On some level, though, it was a conscious decision—I’ve always been fascinated by unconventional subjects and out-of-the-box ideas. When some of these choices don’t work, how did you deal with that? Success is a lousy teacher. Failure is always a friend, and you learn a lot from it. In fact, most of my unconventional choices that have addressed social issues have worked. (For example, Dum Laga Ke Haisha was about body-shaming, Shubh Mangal Saavdhan about erectile dysfunction.) The films that didn’t work were more in the conventional space. You’ve carved a niche for yourself in the industry. Has that brought you peace because you know this is where you belong? Every artiste has to tread the middle path of being at ease and being at conflict at the same time. You can’t be completely content and satisfied, otherwise there’ll be no ambition left. The conflict and struggle is important, and it never ends—first it is to get work, then to get good work, then to be successful, and then to be more successful. Success is also about being satisfied with yourself as an artiste, and being appreciated as one. No life is perfect; you have to have a certain void to continue bettering yourself. How do you bring order to your regular days? There is no routine, and I’m glad there isn’t one. I love my sleep, and so I make sure I sleep for at least seven hours—that motivates me and gives me energy. If I don’t get food and sleep, I become cranky. I ensure that I’m eating, sleeping, getting exercise and appreciating my artistic self—that’s it for me. If you could change one aspect about yourself would you change? I tend to become asocial because I’m doing more films these days. Work is my pleasure, it makes me travel, I meet people and it gives me more space but I hardly get time for myself. Also, I got married young and I hardly get time for my family, so right now I can’t afford to be more social though I’d like to be. You’re also a father—how do you balance being an actor and musician with fatherhood that requires you to be present? It’s very hard to achieve this balance. I’m still new in the industry, so I have to constantly be out here working. At the same time, I have a wife and young kids who I need to spend time with. It’s a struggle to do both. I know that I am not spending as much time with my family as I should. I’m missing the growing up years of my kids and that’s heartbreaking. I’d like to give them the same kind of time, words of wisdom and discipline that my father gave me; it’s because of that discipline that I am what I am right now. I know I’m missing that part, so whenever I am with them, they have my single-minded focus. Your wife Tahira recently shared that she was diagnosed with breast cancer. How did the two of you handle this massive health scare? It was a shocker for us, but she’s such a brave woman. She’s really inspired me with the way she’s dealing with the whole situation. Thankfully, we got to know about it at Stage 0. Tahira underwent a five-hour operation and came out with flying colours. She was so brave, she was always smiling and said, “This is my version 2.0. This is the new me.” I don’t where she found that courage and strength. Of the two of us, she’s always been the one who’s been more emotionally dependent while I was always the more practical one. But this one instance has shown me that she’s braver than me. Your favourite tip for keeping your mental well being? Be objective in your own thoughts and surround yourself with people who are a fine balance of giving you confidence and showing you the mirror and where you stand. What is your relationship with your phone? I need to switch off. I’m constantly connected; my wife hates it and my father is constantly threatening to throw my phone. I’m like a typical teenager who’s always stuck on his phone. When was the last time you felt burnt out? Last year, when I was promoting two back-to-back films—Bareilly ki Barfi and Shubh Mangal Saavdhan. I was really scared and vulnerable back then, because I had never had two back-to-back releases. I was worried that one film might suffer, but thankfully both films did well. If you were to suddenly find 15 minutes of free time in a day, what would you do with it? I’d take a power nap. A sound siesta can make me conquer the world. A quote that gives you strength when times are tough. I’ve always followed a practical approach. “There are no permanent friends and no permanent enemies. There are only permanent interests.” At some point, detachment is important because it really works.